Your privacy settings control which users can view information about your cellar; with account sharing, you can allow specific users to have complete control over your cellar, including the ability to add, edit and delete bottles and tasting notes. For example, if you store your wine in a storage facility that manages it for you, you may want to grant them access to your account to help with management of the bottles in their control. This topic shows you how to setup and use this functionality. The following steps explain how to give others full control of your cellar. You'll need to know the user ID or handle of the account to which you'd like to grant access. Make sure you are logged in to your account – the one for which you'd like to grant control to someone else. Change the search scope to People, enter the user's handle, and click the search icon. Select the user in the results list by clicking on the row. Alternately, if you know the user ID of the account to which you'd like to grant control, open this URL in a new tab, replacing <UserID> with the actual user ID. In the right panel (on both the search results page, and the user's profile page), expand the Account Sharing section, and click the Grant complete cellar control link. Click Ok in the dialog that appears to confirm your action. When successful, the link will update to indicate This user can control your cellar. 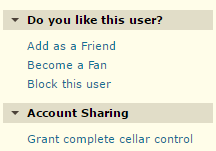 The Account Sharing page within your profile allows you to see which users have access to your cellar, and which user's cellars you have access to. To remove access for a user, click on the user's name, and on their profile page, click the This user can control your cellar (remove) link to revoke access. Once the account sharing relationship has been established, it is very easy for a user to switch back and forth between the different accounts they have access to. When you are done managing another account, click the link in the yellow bar to return back to your own account. 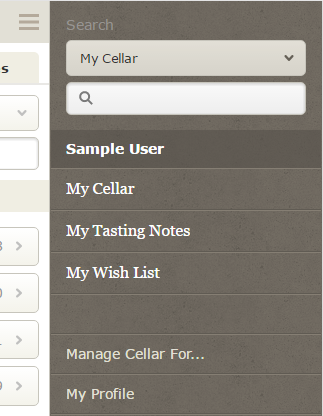 Hover over your handle in the top right of the page, and look for the Manage cellar for section. Click on one of the usernames in the list to access that account. Open the right panel, and tap the Manage Cellar For... option. You'll be presented with a popup allowing you to choose the account you'd like to access. Additionally, while CellarTracker does not maintain detailed audit logs, we do track the actual user account that made a change in the transaction log.